An easy alternative to nails, screws and glue allowing for a quick securing solution indoors and out. Use to keep items tidy and secure - such as large pictures, mirrors, tools etc. Holds up to 7kg per 50 x 100mm strip. 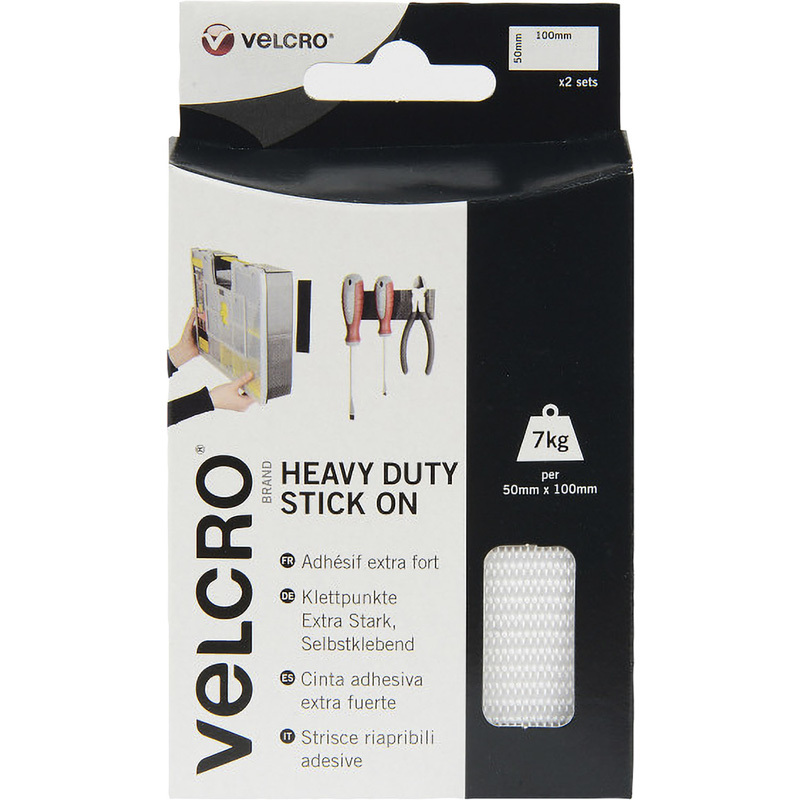 VELCRO Brand Heavy Duty Stick On Strips White 50 x 100mm (2 Pack) is rated 5.0 out of 5 by 5. Rated 5 out of 5 by Brian123 from Ecellent has a very good grip Excellent I bought it to stick a flexible solar panel to a caravan roof and it does the job perfect and if I need to I can remove it Easley. Rated 5 out of 5 by Junnie from Great Stuff ;-) Wanted to hang stuff on wall with out nails and this should do the job nicely..Thanks looks nice & strong.. Rated 5 out of 5 by Happyharry from Great alternative if you do not want to drill Used to fix a mirror in a newly tiled bathroom - worked very well no real pain. Rated 5 out of 5 by SkyhookHanger from Awesome I needed to hang a mirror, but when I went to drill I hit something I couldn’t identify in the wall and panicked. Thinking about an alternative solution I tentatively bought this product (2 packs to be safe) Although the pack said it would hold weight far exceeding that of the mirror, I wasn’t 100% convinced it would work. I was wrong, this stuff is super strong, I don’t know how I’m going to get it off it’s that strong. The adhesive is powerful on both sides also.